The show starts off by Matt spilling coffee on Tony. The guys then segway into the topic of Product Liability Lawsuits. They reference the infamous lawsuit against McDonalds where Stella Liebeck sued McDonalds for spilling a McDonalds coffee in her lap, which severely burned her. The media called it a frivolous lawsuit. The guys delve into the particulars of this lawsuit and breakdown how Product Liability Lawsuits work. 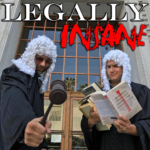 Jokes are told and laughs are had as the guys bring up examples of some similar and hilarious lawsuits from throughout history. Product Liability refers to a manufacturer or seller being held liable for placing a defective product into the hands of a consumer. Responsibility for a product defect that causes injury lies with all sellers of the product who are in the distribution chain. Stellas hospital bills were $10,000. She wrote a letter to McDonalds asking them to pay for her bills, the paid her $800. It was then that she sued. They ended up settling out of court and Stella was awarded $640,000. Dominoes 30-minute delivery promise ended in 1989, because the drivers kept causing car accidents because they were speeding to get the pizza delivered on time.